In 2000, designer Naoki Takizawa took over responsibility for the ready-to-wear line; in 2006 he was replaced by Dai Fujiwara. Fragrances were introduced in 1992 with L'Eau d'Issey, a huge seller despite a brief that reportedly called for the fragrance to smell like water, and despite the fact that Miyake was not a household name at the time. Subsequent releases include L'Eau d'Issey Pour Homme (1994) and Le Feu d'Issey (1998). See also review for L'Eau Bleue d'Issey Pour Homme. Fragrances are produced under arrangements with Beaute Prestige International, a division of Shiseido. 2011: L’Eau d’Issey Florale, A Scent by Issey Miyake Soleil de Néroli, L'Eau d'Issey Summer 2011, L'Eau d'Issey Or Absolu / Gold Absolute. 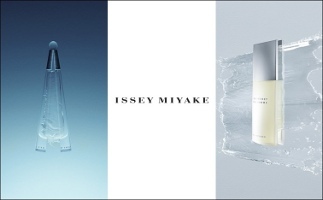 The Issey Miyake fragrance line can be found at major department stores or online discounters. See all articles on Now Smell This tagged Issey Miyake. Read A Flash of Memory (an op-ed piece by Miyake, about nuclear weapons) at The New York Times. 1. From DESIGN REVIEW; Inventive Garments Designed to Go With the Flow, 11/26/1999.